I am a huge fan of avocados. So I made some avocado pesto dip. In my opinion, avocados make everything better. Avocados are great on their own, in salads or smoothies. This avocado pesto is fantastic. It is oil free and dairy free. If you are worried about the avocado browning, you can always squeeze a small amount of lemon juice onto it. I ate it for a second time today and it tasted great even though it had browned a little. 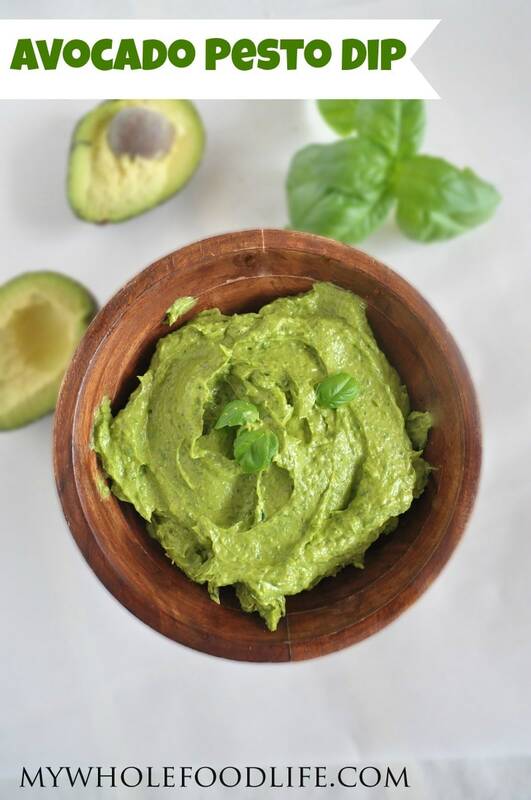 In a food processor , combine the avocado, basil and spinach until smooth. Then add in the nutritional yeast, parsley, garlic and salt and pulse until everything is smooth. If you don't want the avocado to brown, you can squirt a little lemon juice onto it. Store the dip in an airtight container in the fridge. It should last 4 days. You may be able to freeze it for longer . In case you were wondering, nutritional yeast is different from bread yeasts. It adds a nutty and cheesy flavor. If you don't want to use it, you can omit it, but I suggest adding a 1/4 nuts instead. Enjoy! Love the sound of this combination. Will have to try this a.s.a.p. I'm not a fan of nutritional yeast. What nuts would you suggest be used instead? You can just omit it if you like. Or, if you do dairy, you can use parm cheese. Ooooh wonderful! Two of my favorite things! And now it can be a healthy treat as a dip too! Win! on top of it sounding so good - your photography makes EVERYTHING look moocho delicious. I am so imagining this as a pasta sauce right now! What a great idea! It's like a pesto quac :) Sounds delicious! I made this today and it was so good I had to stop myself from eating the entire bowl :) I did squirt some lemon juice in it because I need it to last until Friday when I use it as a pasta sauce!